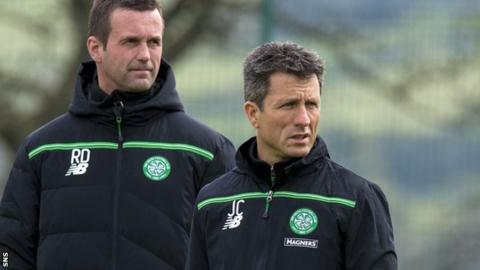 Celtic assistant boss John Collins has confirmed he will be leaving the club along with manager Ronny Deila at the end of the season. The Norwegian announced on 20 April he would depart, before a fifth straight Scottish title was secured on Sunday. "I came with Ronny, so it's only right I leave with him," said the former Scotland midfielder, who played for Celtic from 1990 to 1996. "A new manager will come in and bring his own staff with him." Collins said he will "go on some summer holidays and get some sunshine" before contemplating his next move, having helped Deila steer the club to successive titles in his two years back at Parkhead. "It's disappointing to leave but a lot of people would be delighted to have what I've had," said the 48-year-old. "I've played for the team and won a cup and two league titles as part of management. History will dictate whether it was good or bad. "There have been lots of highs, some lows, but we've got five in a row. "Of course, we all want better, we all want more. But we got the title, we got five in a row, so we pass the baton on to the next manager and see what he does." Collins admitted that in the Champions League and Europa League, as well as their semi-final defeats by Ross County, in the League Cup, and Rangers in the Scottish Cup, Celtic "have not played as well as we could have. Ultimately, that has proved disappointing". High expectations from supporters made for "constant challenges" at Celtic Park, he noted, but he believes they should still take pride in their run of Premiership titles. "When you win, people can be unhappy, when you lose, people are really unhappy," he said. "There are big demands, but that's life at a big club. "There are not too many clubs in Europe who have five in a row. We've got it and the target now is six." Collins stressed it is now "absolutely vital" that Celtic act quickly to appoint replacements for Deila and himself. "They can't get the next manager in quick enough," he added. "He has got to assess the squad and prepare for the Champions League games that come straight away. "We have got lots of players away on international duty, so it is not an ideal scenario for the new manager to come into. "We had it two years ago; not easy to manage. But you just have to deal with the situation as best you can, the quicker the better. "But you can't rush decisions either. You have to take your time and [chief executive] Peter [Lawwell] and the board will take their time and get the right man."